Years ago, I agreed to represent a client who wanted to bring a lawsuit against a particular department of the federal government. Since the opposing counsel would be the U.S. Department of Justice, and with my being new to that game, I enlisted as co-counsel an accomplished federal litigator with extensive experience in dealing with the DOJ. At one of our first meetings, I asked him, “What do you think are our odds of beating the DOJ?” I will never forget his response. With a silent smile, he slowly nodded, looked down and scribbled something on a sheet of paper before handing it to me. Now, nearly 20 years later, that is the exact memo — or warning — I want to send to President Trump. That is … unless he demonstrates soon a willingness to exercise his constitutionally delegated powers to terminate and remove the partisan factions within his Department of Justice that are either failing to use, or are intentionally misusing, their authority to unlawfully destroy his Presidency. If he does not, I believe the abbreviated ineloquence of my former colleague’s memo could likely convey an accurate forecast of his fate. The DOJ is an institution vested with formidable resources, including its authority over the FBI. It is also often the beneficiary of a thinly veiled, yet presumed, allegiance with most of the federal courts in which its attorneys operate. As a result, and given enough time, in most cases, the DOJ is empowered — via favorable rulings and otherwise — to access, manipulate and maneuver the federal laws, rules, regulations and procedures — not to mention witness testimony — in whatever ways it may deem necessary to ultimately bring most of those it targets to heel … perhaps, even including a President. Unconstrained, those with such potentially unlimited power could easily go rogue and morph into a government unto to themselves. Theoretically, however, that should not be possible. The Constitution empowers the people to elect a President to whom they give their proxy to keep it in check. Yet, today we are witnessing this chain of authority being turned on its head and a President who seems — on the surface, anyway — to be doing little with the powers of his office to put it right. In the course of Sessions’ apparent hibernation subsequent to his recusal, a good portion of his responsibility as a member of the President’s Cabinet to run the DOJ appears to have been handed off to his unlawfully conflicted Deputy Attorney General, Rod Rosenstein, who, in turn, has unlawfully delegated unfettered authority to an unlawfully conflicted Special Counsel, Robert Mueller, to prosecute any crime he sees fit and who, in turn, has unlawfully abused that unfettered authority to unlawfully establish what is an unlawfully conflicted — not to mention unconstitutional — shadow Department of Justice. To stalk all allies, friends, relatives and associates of this nation’s duly elected President in the hope of removing that President from office before his Administration is able to fully discover, expose and prosecute the many felonies the corrupt have committed. Moreover, this criminal cartel has apparently blessed its members with an impenetrable umbrella of immunity. Notwithstanding the alleged crimes many are known to have committed, — think: Brennan, Comey, McCabe, Strzok, Page, etc. — not one of them has yet even been indicted, much less prosecuted, for any of them — even for those crimes having nothing to do with any supposed “collusion” — think: Hillary, Huma, Rice, Power, etc. Alarmingly, in the course of the last two years, only a few have lost their jobs, while the rest remain completely untouched. By contrast, however, among the President’s allies and supporters who have been investigated, subpoenaed, deposed and otherwise harassed by this shadow DOJ in the course of that same time period, Flynn, Manafort and Cohen have already been indicted, prosecuted and either tried and convicted or coerced to enter guilty pleas. Exactly whose government has done this? Is it possible that the criminal cartel directing this skewed operation has been allowed to wrongfully assume greater control over the DOJ than the President? In the beginning, the President was understandably… let’s say, disoriented, as were many of us… by the national fog created by the media’s unending advancement of what may now be thought of kindly as the delusion of collusion. Since then, however, we have all been informed of facts that tell us that this false narrative was a production staged by none other than corrupt officials within the DOJ and FBI working with other corrupt operatives elsewhere, and all under the brilliant direction of none other than the very candidate who the President defeated at the polls — Hillary Rodham Clinton. And yet, still, nothing changes. To avoid being impeached for obstruction of justice, the President must not use his authority to stop a rogue DOJ from continuing an unending, hostile and unlawful search, prior to its discovery of some presently unknown offense for which the President can be impeached. The irony of this catch-22 is only exceeded by its absolute absurdity and must not be allowed by the President to continue to stand in defiance of reason if we hope to preserve our democracy. Perhaps his unraveling of this Gordian Knot of corruption need not be as difficult as it might first appear, however. I can’t discuss an ongoing investigation… But I can tell you this. We both know that, if you or I had ever been caught doing even a fraction of what we all already know that she did in mishandling state secrets, you or I would most certain be in federal custody by now. 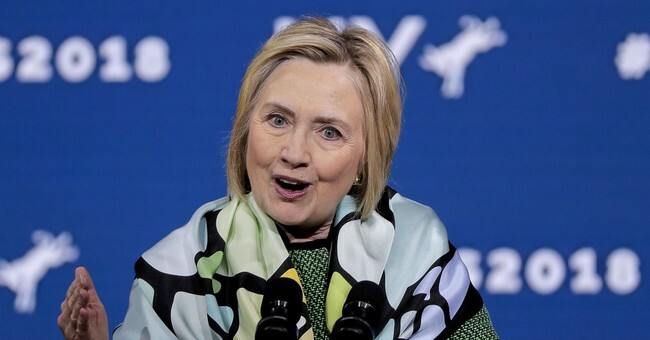 Order his DOJ to indict, prosecute and, if appropriate, convict Hillary Rodham Clinton forthwith — albeit belatedly — for her violations of the Espionage Act, together with any other felonies she may have committed in the course of the cover-up that ensued. Simultaneously, also give notice that any employees of the DOJ and FBI who refuse to comply with this order shall be immediately dismissed and replaced; particularly including, if necessary, Jeff Sessions and Rod Rosenstein. These two orders alone will concurrently reaffirm the rule of law, restore the public’s confidence in federal law enforcement, safeguard the legitimacy of our electoral process and put all the other corrupt below her on notice that their felonious behavior will no longer be either tolerated or ignored under this President’s Administration — not to mention its fulfillment of a campaign promise he made that, in the minds of many voters, is on par with his building of a wall. Whether he does it now or after the midterms is a political decision only he can make. The important thing for him to come to grips with now is that a decision delayed can often end up being a decision to do nothing … until it’s too late. And that, of course, would sadly refer the President back to the dire forecast contained in my colleague’s two-word memo.